When it’s time to get that new goodie that Apple just announced, most geeks start looking around the house for things to sell, or at least I do. Whether it’s an outdated phone, or a pair of shoes that never made their way out of the box, there’s money to be had in the things that you never got around to using. While I was on TWiT this week, I learned about a new app that might be the quickest, and best, way to sell those things off. It’s called Yardsale, and one of the people involved is co-founder of Revision3, David Prager. Now that Revision3 has been acquired by Discovery, Prager has more time on his hands to dig back into technology. It’s safe to say that the Y Combinator backed Yardsale is a wise use of his time, because it’s pretty impressive. On the show, Prager said that Yardsale was a location-based app that lets you buy and sell things, and was also the “fastest way to post things on Craigslist”, which is a feature of the service. That alone makes it worth trying out. As soon as you open the app and register using your Facebook account, Yardsale grabs your location and shows you the things that are for sale around you. It’s pretty much the fastest onboarding experience that I’ve ever seen with an app. You can see the things that have been on the site for a while, via the closet, or see what has been freshly posted as of late. Trying to buy something is similar to being at an actual yardsale, you can haggle with the owner on the best price. Once you’ve bought it, simply arrange a pickup time and place and you’re set. Just like that. The app is extremely well done, and the user experience is perfect for buying and selling quickly. There’s even a neat feature that lets you save a search for something, which will alert you when something matches. For example, I’m on the market for a Nike+ Fuelband, but my size is sold out on the Nike site. Cross-post to Craigslist using your account if you like, and then you’re off to the races. Seriously, it doesn’t get as simple as this when it comes to selling things online. The fact that all of this is driven in an iOS app makes it feel even more intimate, and using real identities from Facebook is a smart move. Of course, only your last initial is shown on your profile, to protect you. 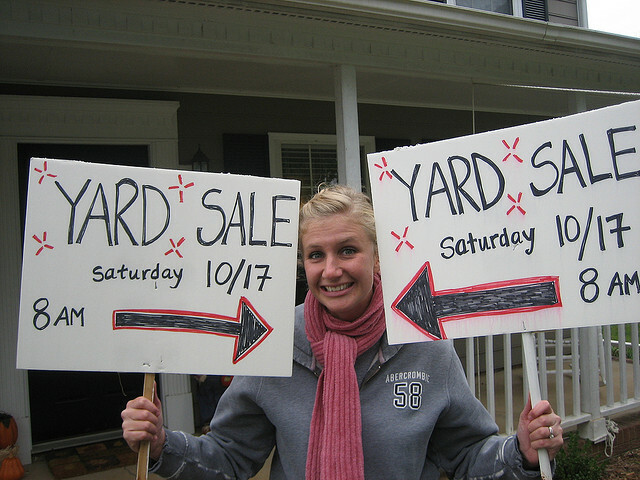 If you live in a large metropolitan area, Yardsale is worth a look just to see if there are any hidden gems around you. If you’re in a smaller area, why not start listing things now and get your friends on the service? Yardsale is completely free, so give it a try.